The world of storage has received a range of major enhancements over the last couple of years. Primary storage systems are constantly moving away from hard drives to solid state drives. SSD solutions used to be expensive in the past if you were going for premium performance, but that has changed over the last 2 or 3 years. Prices of SSDs are constantly falling, bringing the capacity per dollar down to where hard drives used to be a few years ago. Not only that, but SSD solutions now come in various form factors that can be deployed in small form factor solutions without the need to sacrifice on performance. Intel has been one of the pioneers in bringing about the modern SSD era. Starting in 2008, they have brought a range of solutions. 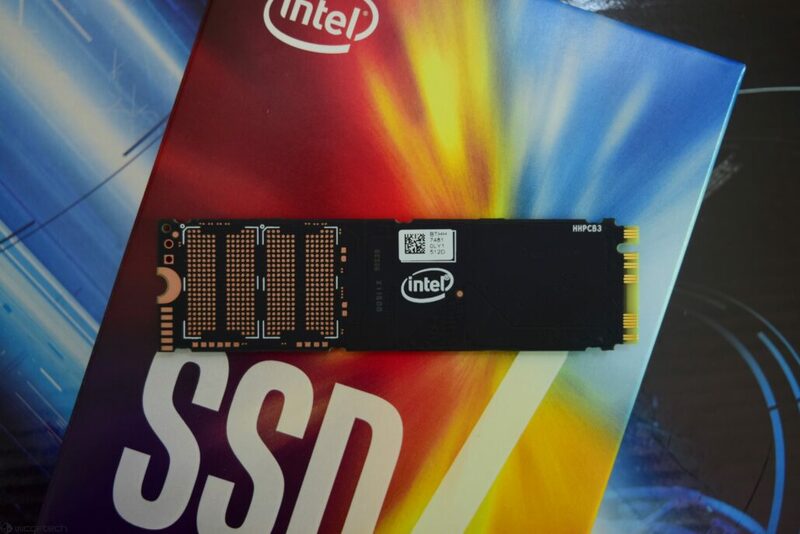 In 2015, they introduced the SSD 750 series which brought the PCIe based SSD solution using their MLC NAND flash and running on the NVMe interface. This was a revolution for the client market and just a year after, Intel introduced the M.2 (NGFF or Next Gen Form Factor) standard for consumers. 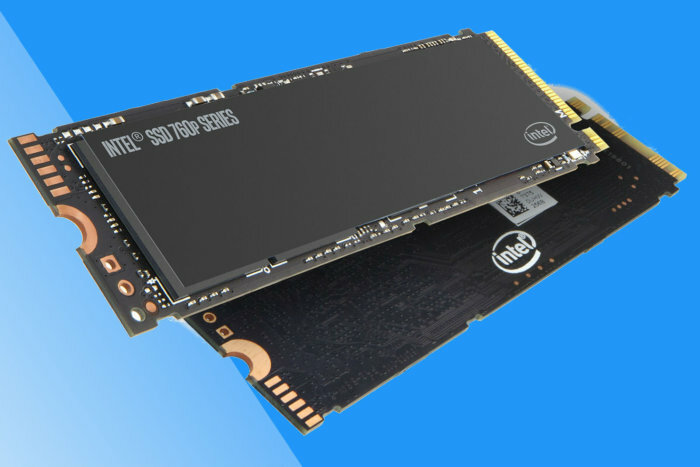 The consumer aimed SSD 600p series brought affordability back to SSDs at a time when Intel was competing directly with another major SSD manufacturer, Samsung. Samsung also introduced a range of new products based on the M.2 and NVMe standard. 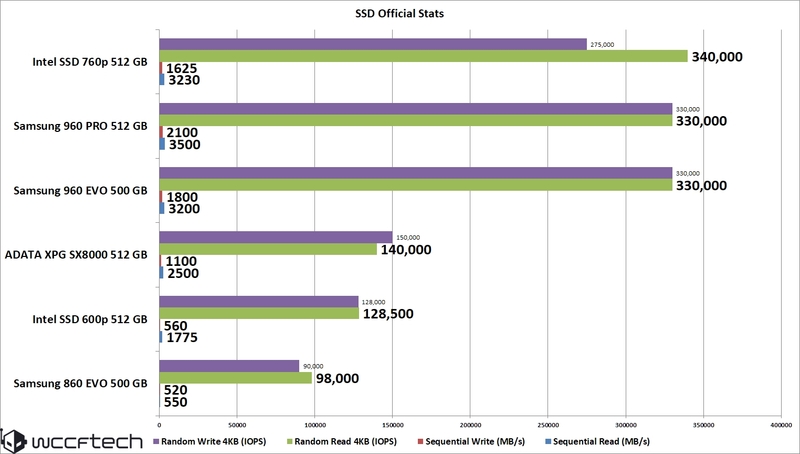 They also had the upper hands in terms of pricing with their SSD 850 series while their next SSD 950/ SSD 960 series blazed through the performance charts. Samsung also just recently updated their SSD lineup with the 860 series which brings higher capacities in the similar affordable price range but Intel isn’t going silent this time. 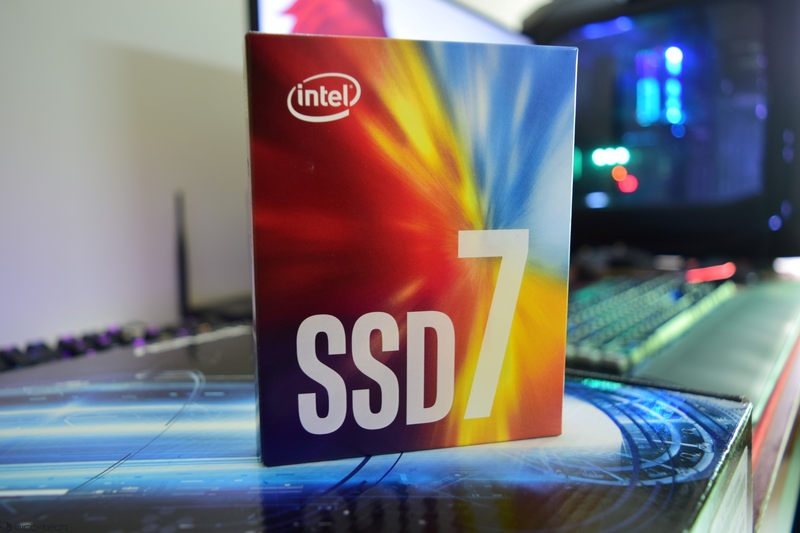 Intel brought their new SSD 760p series in the market around the end of last month. 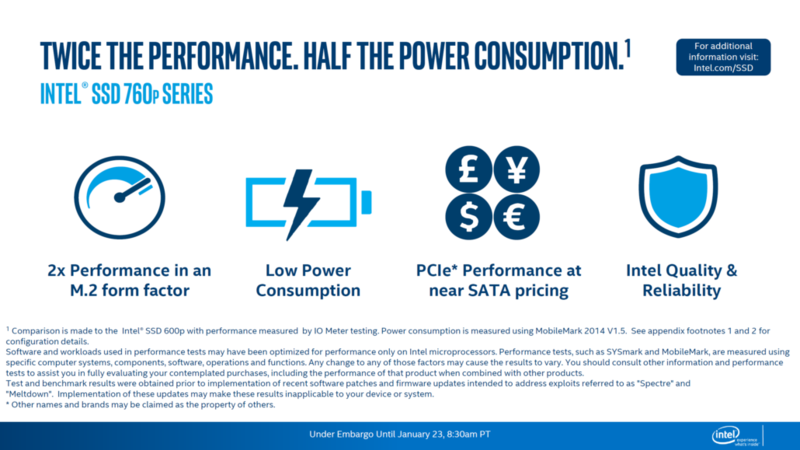 Succeeding the Intel SSD 600p, the new drives are meant to perform faster and at much more affordable prices. 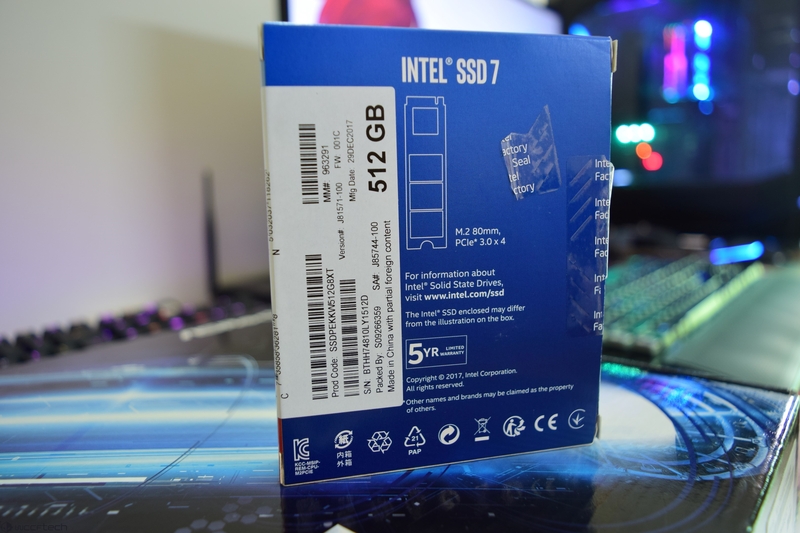 Today, I will be testing the Intel SSD 760p 512 GB NVMe storage drive which comes at a cost of just $199 US. How does it fair against other competitive products in this market range? Let’s find out! 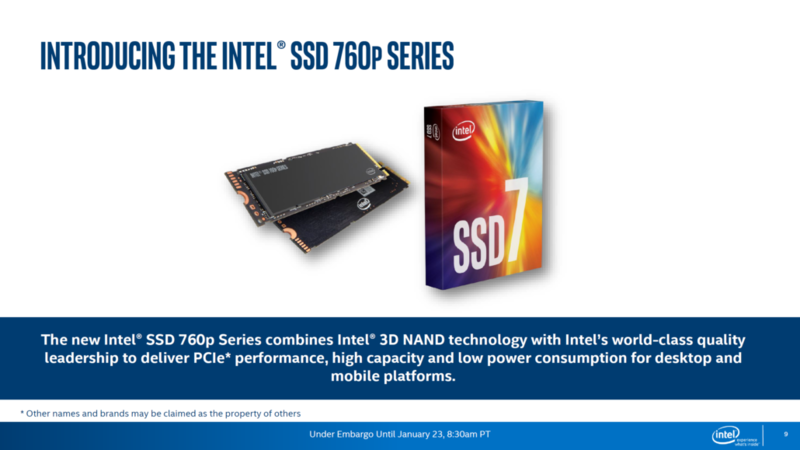 The Intel 760P series SSDs are part of the latest Intel 7 series SSD family and hence, they come with a new design language. 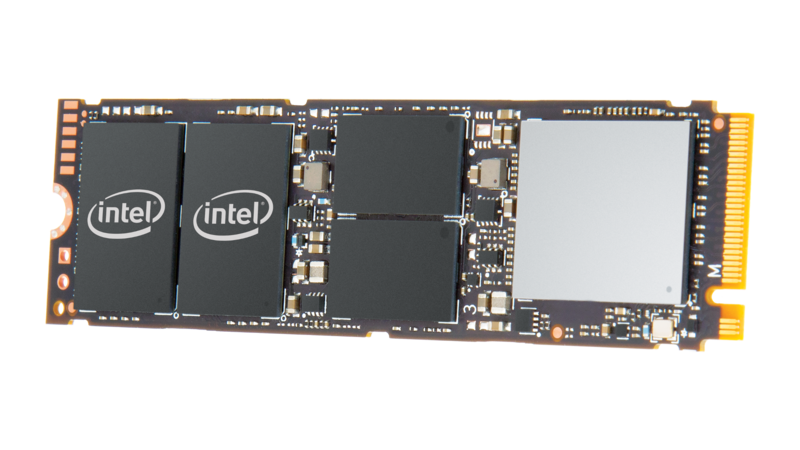 The SSDs are based on the NVMe (M.2) form factor and features a 64-layer TLC-based 3D NAND flash which offers larger capacities, better performance and slightly lower power input when compared to Intel’s previous M.2 offerings. 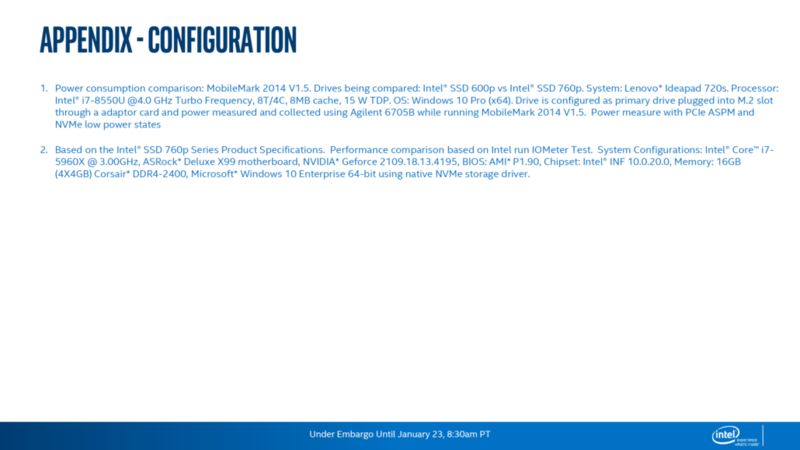 Intel is using a custom build Silicon Motion controller which is labeled as SM2262 (Intel SSD 600p series had SM2260 controller). 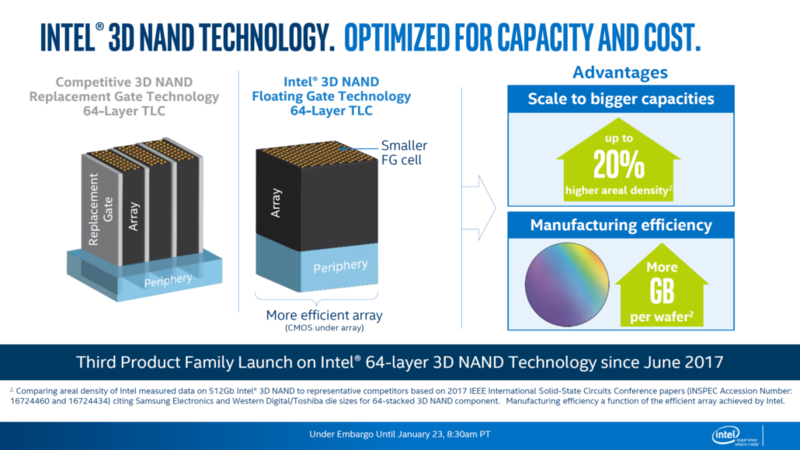 Intel is using a 64-layer, 256Gb 3D TLC NAND flash design on this SSD family. The smaller die size compared to competitors would mean that the lower density ssds will be able to drive performance much faster, making them a compelling upgrade for the masses. The SM2262EN and SM2262 are 8-channel high-performance PCIe Gen3 x4 SSD controllers ideally suited for client SSDs. The SM2262EN and SM2262 feature four 8 gigabit-per-second (Gbps) lanes (PCIe Gen3 x4) of simultaneous data flow coupled with eight NAND channels. 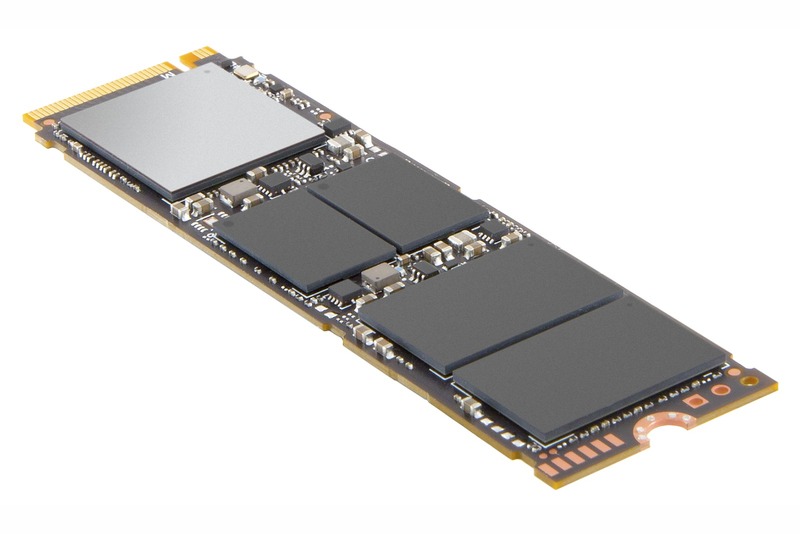 By optimizing hardware and software to take full advantage of PCIe 3.1 and NVMe 1.3 SSD specifications, the SM2262EN and SM2262 solutions deliver ulta-high performance and better reliability SSD solutions. In addition, with the state-of-the-art low-power design, the SM2262EN and SM2262 deliver ultra-low power consumption no matter in low power or active state. Furthermore, these SSDs are aimed at the budget tier which means their mainstream marketing will gather a bigger audience. What this means is that these products will be great for consumer mobile and desktop platform. 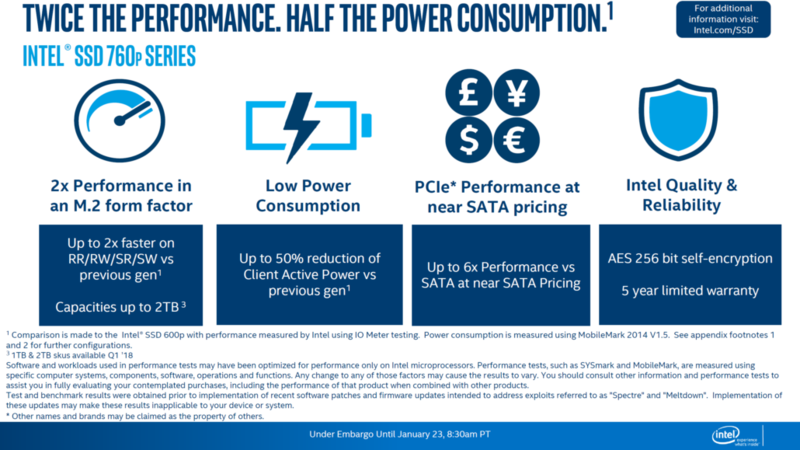 Intel themselves state that the 760P SSDs offer twice the speed at half the power consumption at a affordable price range. 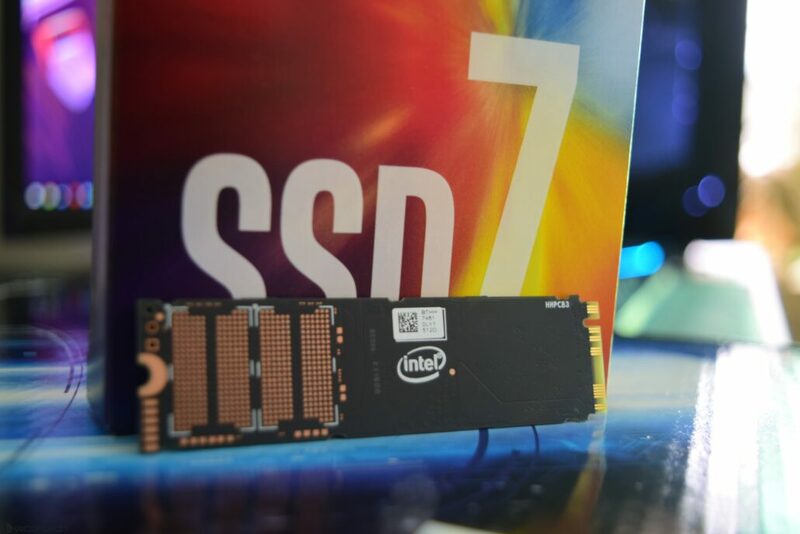 In terms of performance, the intel SSD 760P has sequential read speeds of 3.23 GB/s and write speeds of 1.625 GB/s. 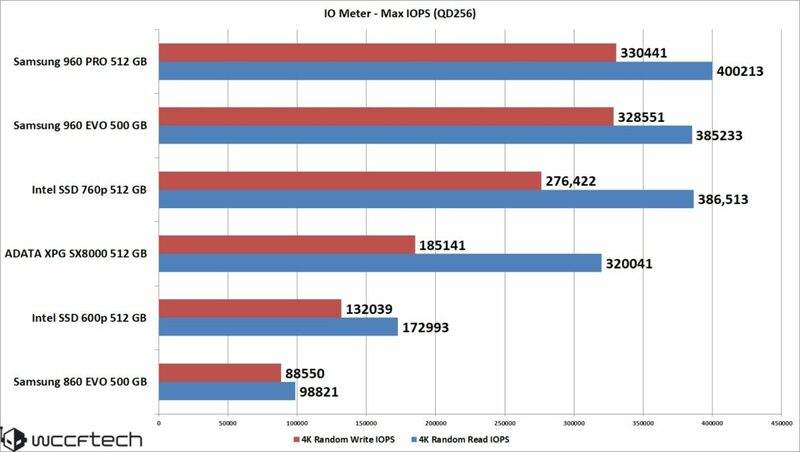 The Random read speeds of these drives are up to 340K IOPs and write is 275K IOPs. Power consumption while the drive is active is rated at just 50mW and idle is rated at just 25mW. The endurance rate is 72TBW per 128 GB which should last a good amount of time with these drives. With up to 6 times the performance of a regular SATA drive at similar pricing, the new SSDs will also support a 5 year warranty and AES 256 bit self encryption for best quality and reliability. The drives are designed for the consumer market and the pricing reflects that. These are some of the most affordable and fastest M.2 SSDs designed to date with a 128 GB solution priced at $74 US, the 256 GB solution priced at $109 US and the 512 GB solution priced at $199 US. Intel has stated that the higher densities will arrive around Q1 2018 and will include 760P series SSDs with up to 2 TB capacities. The Intel SSD 760p comes in a small cardboard box which should be expected if you have used or seen a M.2 drive before. The front of the package is very colorful and comes in shades of red, blue and yellow. 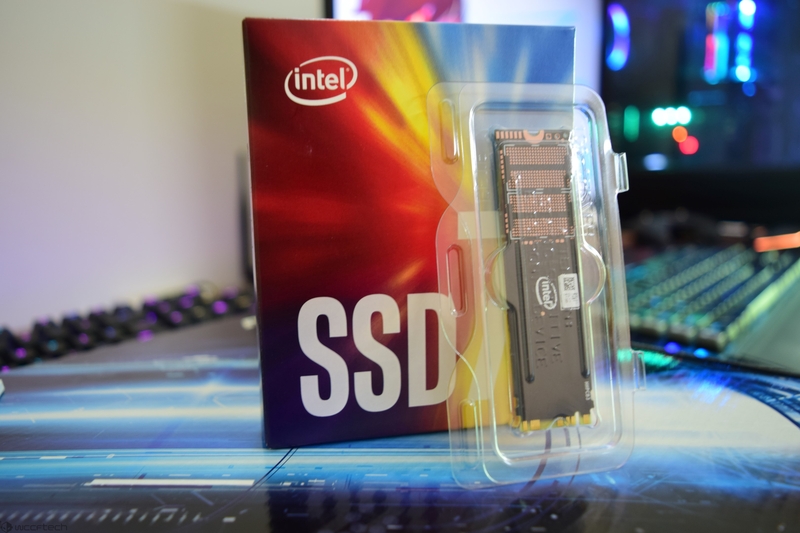 An Intel logo on the top left corner is followed by a larger SSD 7 logo in the middle of the box. Overall, the package looks very eye catching from the outside and hopefully, the tests also yield similar results. 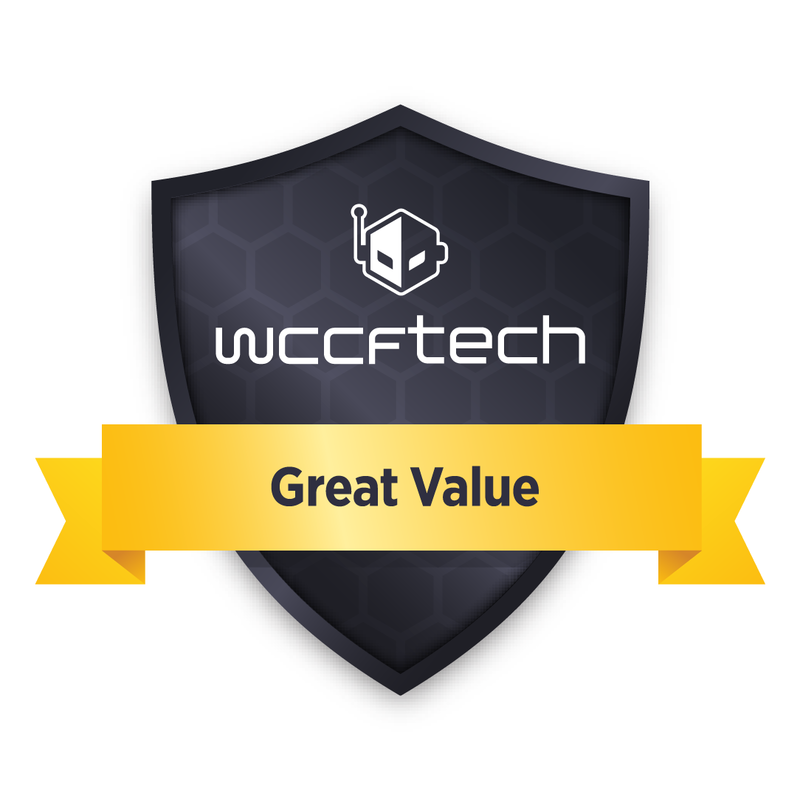 The back of the package lists down some specifications of the M.2 drive such as the M.2 80mm, PCI express 3.0 x4 form factor, a 512 GB capacity, 5 year warranty and other marketing labels. The box is protected by an Intel Factory seal which has to be removed to access the contents inside. The package includes two items, one is the warranty booklet and the other is the drive itself. The box literally carries no weight at all. 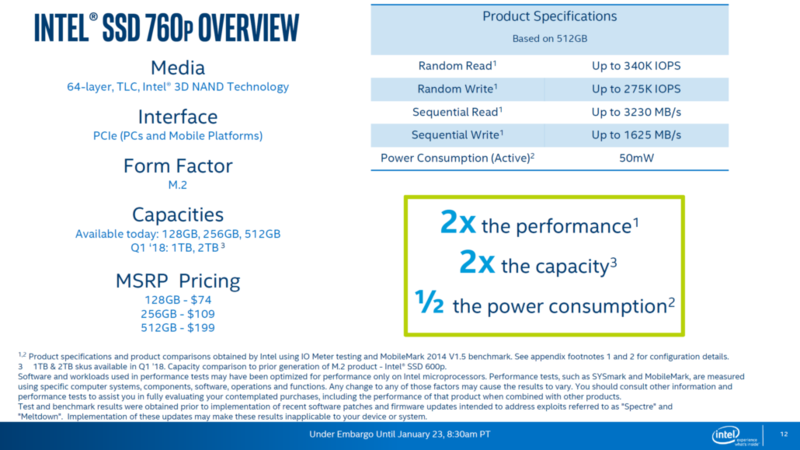 The Intel SSD 7 looks like a standard M.2 SSD out of the box. It did come in a plastic container which is always a good thing to see. Aside from that, there’s nothing interesting to talk about of the box contents so let’s take a closer look at the drive itself. 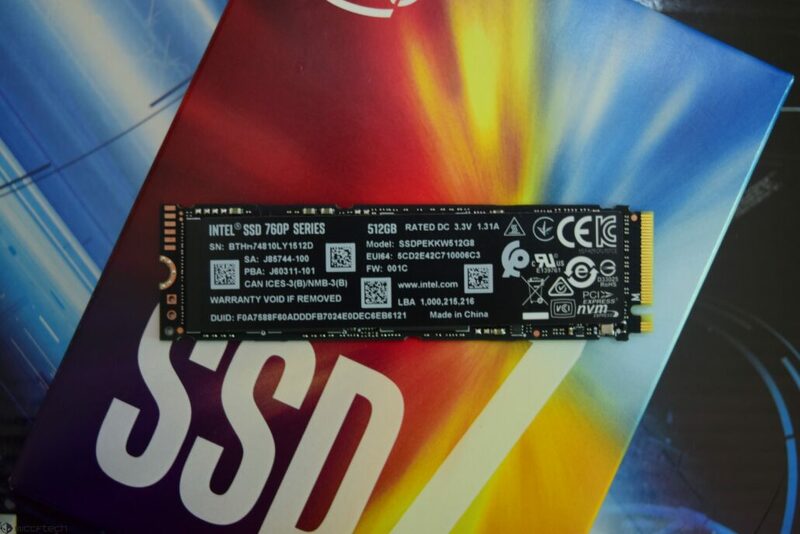 The SSD 760p comes with a black colored PCB with copper, gold and white accents and has a front cover sticker which hides the main components underneath it. On the flip side, we can note space for two additional NAND packages which is reserved for the drives greater than 1 Tb capacities. We can also spot a small Intel logo which is a good touch to these drives. Coming over to the insides, we can note the entire package in detail. The drive has two NAND and dual DRAM packages. The DRAM consists of two 256 MB Micron DDR4 which can be issued parallel operations by the SMI controller for faster performance. The SMI controller itself is located under a large copper heatsink block with nickel plating on the top. This would help improve heat output but the sticker is something to worry about in this case. Our test platform for this review consisted of an Intel Core i7-8700K processor which ran at stock clocks on the AORUS Z370 Gaming 7 motherboard. The platform was coupled with 32 GB of DDR4 memory from G.Skill (Trident Z RGB / 8 GB x 4) and the Corsair RM 750X Gold Plus. For graphics, I used the ASUS GeForce GTX 1080 Ti STRIX OC. This rounds up as a high-end mainstream platform for tests with modern day SSDs. 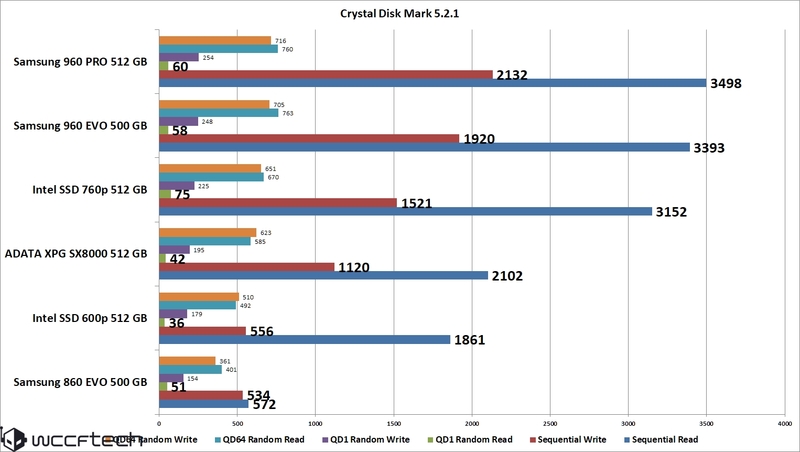 As you can note from our list above, the Intel SSD 760p 512 GB drive was compared against five different 512 / 500 GB SSDs. 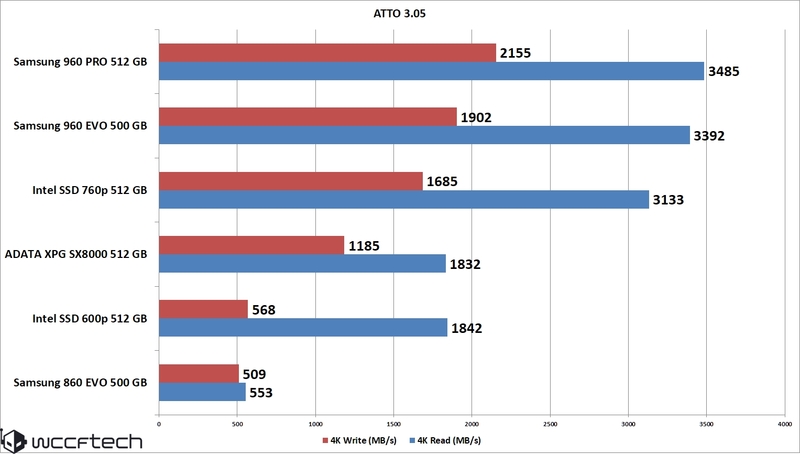 It wouldn’t have been wise not to compare the Intel SSD 760p with their SSD 600p to notice the generational gains in performance. I also used the Samsung 960 Pro, Samsung 960 EVO, Samsung 860 EVO and the ADATA XPG SX8000 drive for comparison purposes. You can check out the benchmarks in the next segment. 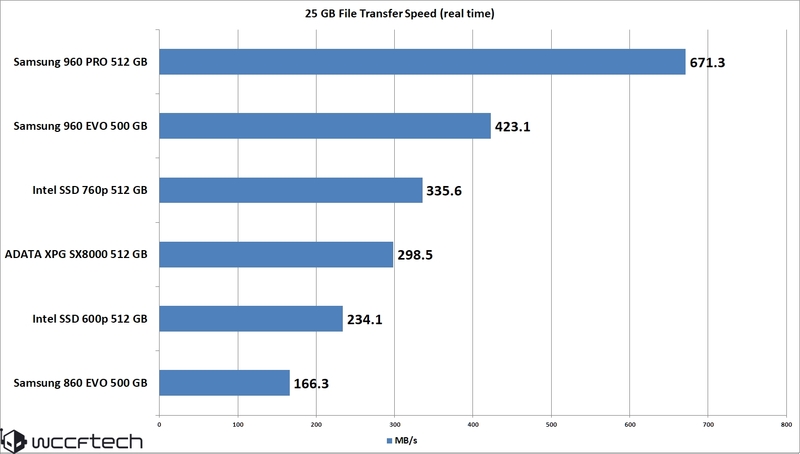 To test the maximum average transfer speeds of the drives, I used a 25 GB file to test the limits. It seems like the Intel SSD 760p is running out of cache after a sustained write test. It means that the drive’s burst speed wouldn’t last longer and would eventually stumble compared to other modern solutions such as the Samsung 960 EVO and PRO series. Nevertheless, it still is faster than the rest of the drives we tested and wouldn’t be much of an issue for users who are looking to upgrade the aging SATA drives. Iometer is storage testing software tool that simulates application input/output to main storage on hard disk, SSD or storage networking devices. Iometer is designed for use in both single systems and clusters. The tool allows users to set custom input/output profiles to simulate different application workloads. 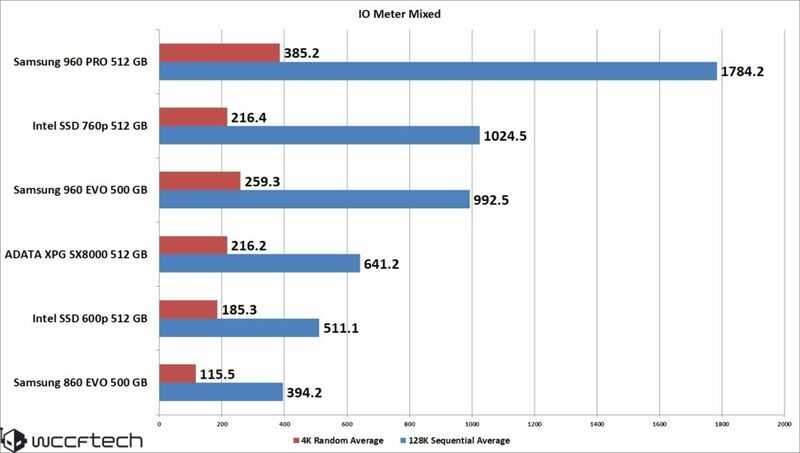 Iometer is a useful benchmarking tool for storage; it’s often used to test storage solution performance as well as different settings in the software environment. The tool can be used to measure virtual disk performance by simulating environments with customizable workloads. Iometer was created by Intel in 1998. The company stopped development in 2001 and gave the project over to the open source community. 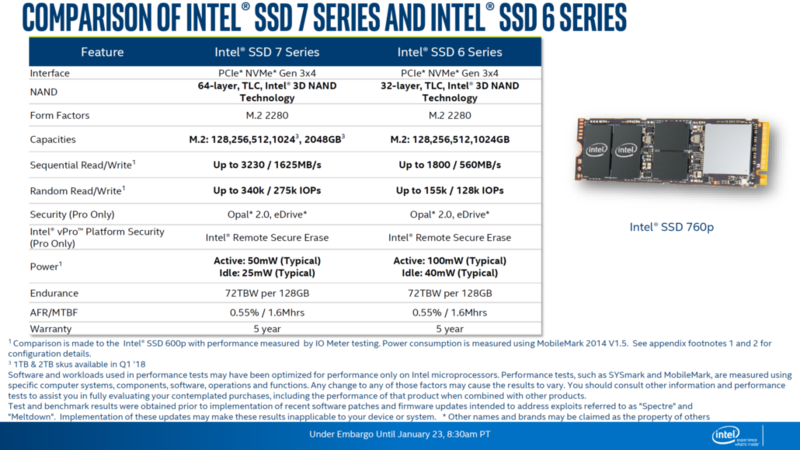 The Intel SSD 760p comes with some major changes over the SSD 600p series. Intel is offering some of the fastest storage systems to enterprise and business clients, they also have very fast performance SSDs for enthusiasts in the form of Intel Optane 900p which utilize their 3D Xpoint technology. Those come at a cost and are out of the reach from literally the entire mainstream market. The Intel SSD 6 series has been in the mainstream for quite some time and with SSD 7 series, Intel is giving mainstream users a good upgrade. 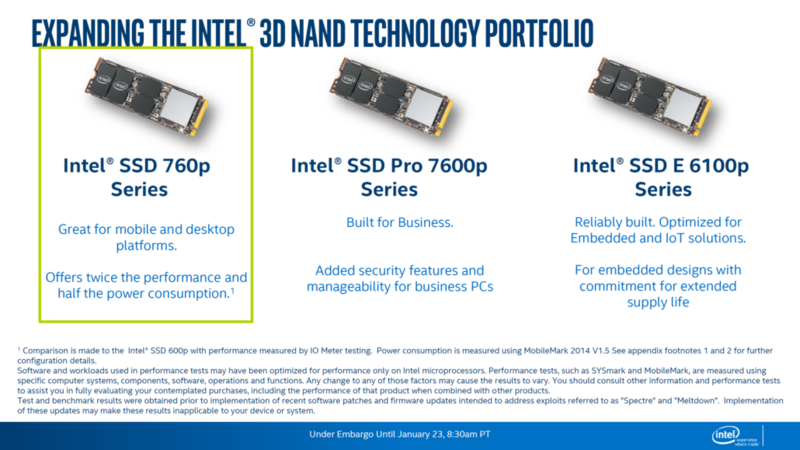 Intel SSD 760p is tackling the mainstream market which is an interesting place nowadays. With NAND Flash price going up, SSDs were ought to become more and more expensive. 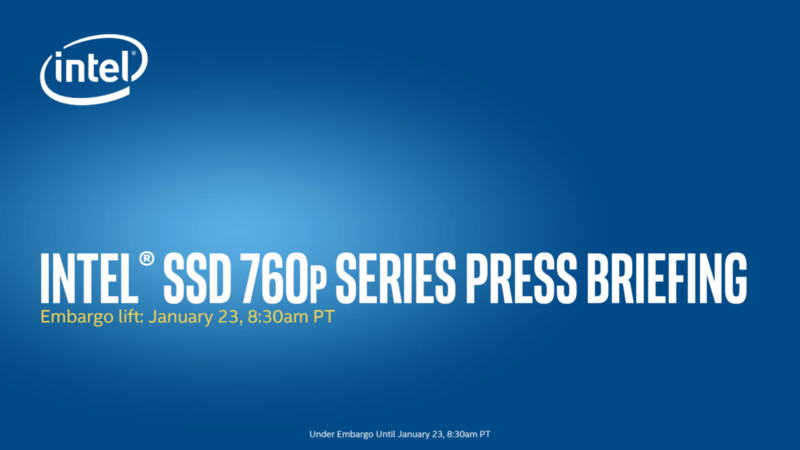 It isn’t the case with SSD 760p series, they are available and at very decent prices. We aren’t looking at SATA level prices which we hoped for but it’s getting there. For $199 US, this 512 GB drive is a significant leap for any mainstream PC over a SATA storage system. It is a good performance jump over the SSD 600p and even takes out some of the more high-end devices available in the market while lacking compared to others. 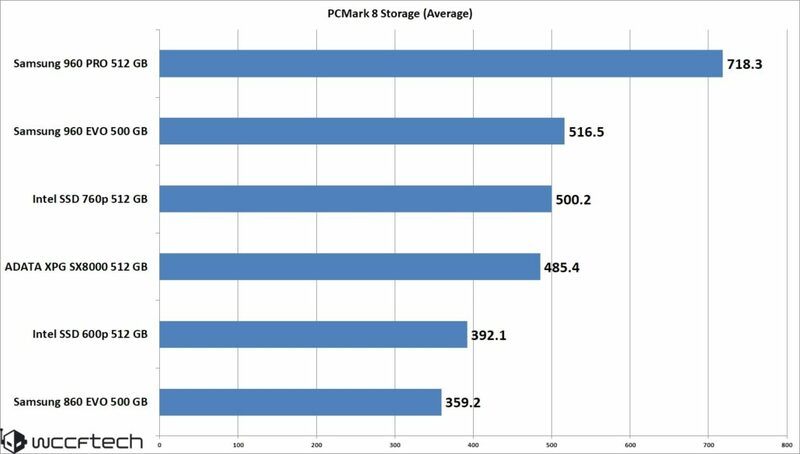 In comparison with Samsung’s 960 series drives, we see lower performance than the EVO series while the PRO series just blazes ahead. But we are talking about a different price segment for those drives. They cost more than the Intel solution. Samsung’s 860 EVO also just launched with the 500 GB variant costing just $170 US. The SATA based SSD solution was marginally slower than Intel’s drive and the PRO solution costs $250 US. Intel takes the win in the competitive segment. In terms of performance, the drive is sometimes consistent and sometimes when transferring large files, it may run out of cache leading to some users experiencing performance inconsistency. For those wondering how it performs in games, well I tried both Single player (DOOM, Assassins Creed: Origins) and multiplayer (Battlefield 1, Overwatch, Destiny 2) titles. Compared to SATA drives, any SSD would help shave off a few seconds but comparing SSD to SSD game load times isn’t practical as the difference is much lower compared to that of an SSD. Similarly, an SSD will immensely help to boost productivity application performance when running it as a main operating system drive compared to SATA drives. I think that much is known by now, but SATA is still the king in terms of price per GB and there still isn’t a SSD solution right now that can match SATA prices. 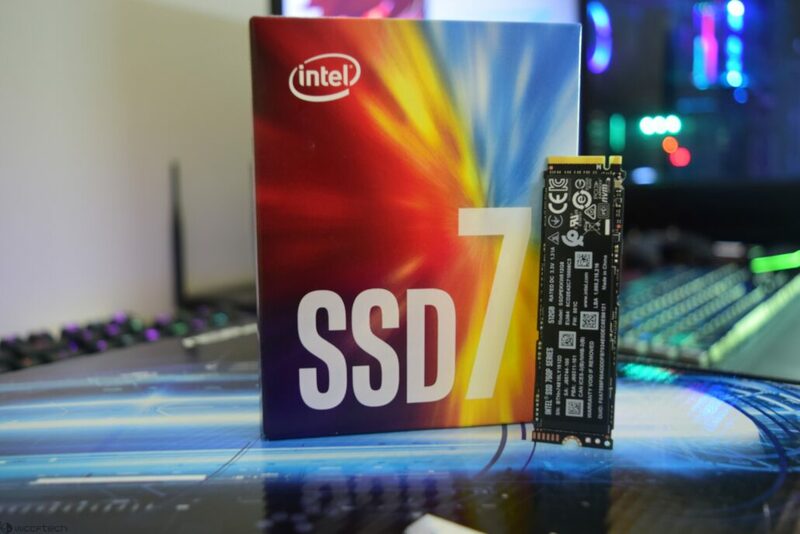 For bulk storage, SATA drives are still the go-to solution but for those who want to build a Steam or games library to take advantage of SSD speeds, they can now purchase an affordable solution in the form of the SSD 760p from Intel and call it a day. 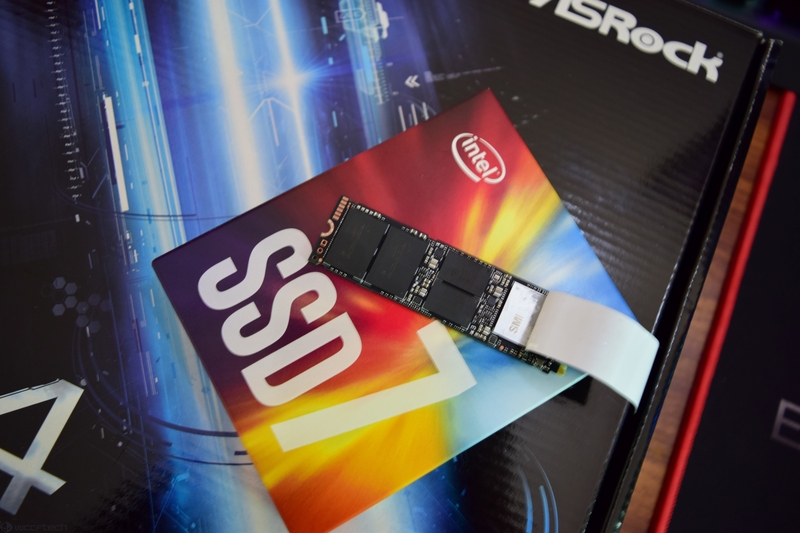 We have been through years and years of price variations in the SSD market and finally getting close to SATA like pricing and high-end SSD performance in the form of the Intel SSD 760p series. It’s a very competitive solution for the mainstream user who is looking to build a new PC or those who are looking to upgrade their SATA solutions for faster performance. Affordable and performance wise great, at $199 US, the 512 GB Intel SSD 760p delivers great value to mainstream users who are looking to boost their PCs with faster, NVMe grade solid state solution.